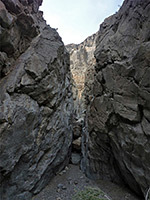 Slit Canyon (an unofficial name) is one of several narrow ravines draining the southwest edge of the Funeral Mountains, which border the north side of Highway 190 between Death Valley Junction and Furnace Creek. The hills are generally several miles from the road, separated by wide, sloping, alluvial plains, but Slit Canyon and vicinity is reachable via the gravel track to Hole-in-the-Wall, a small gap in a thin, intermediate ridge that parallels the mountain range. The track is accessible to all vehicles as far as the gap, then is for 4WD only, continuing 5 miles to a colorful basin named Red Amphitheater. Both areas are relatively popular for free primitive camping (permissible once 2 miles from Highway 190); the nearby narrow canyons though are less well-known. Death Valley is one of very few NPS units where such camping is allowed, without need for a permit. Slit Canyon emerges from the steep sided mountain foothills just over a mile north of Hole-in-the-Wall, and upstream it soon enters an enchanting series of narrow passageways, interspersed by chokestones and dryfalls, some climbable, others passed by scrambling up and around. Easy travel is stopped after less than half a mile by a higher fall, but a longer bypass leads to other short, narrow channels, in between generally wider sections. 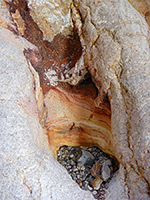 The surrounding limestone (dolomite) rocks are colored light shades of grey and brown, interspersed with some deep red patches, and polished along the streamway. Another drainage a short distance southeast also invites exploration. 19 views of Slit Canyon; gallery, slideshow. 24 views of wildflowers along the approach track. The track to Hole-in-the-Wall forks north off Highway 190, 1.9 miles southeast of Zabriskie Point, and is unmarked except for a small notice stating 'Dead End 4WD Road', though the surface, while rather bumpy, is usually fine for 2WD vehicles until the gap, after 3.8 miles. The road runs all along a wide gravelly wash which drains through the gap from the canyons beyond. The wash is lined with many wildflowers in spring, most numerous being yellow cups (camissonia brevipes). The low walls at either side do not obstruct the increasingly good views south towards the yellow-white hills around Twenty Mule Team Canyon. The upwards gradient is gentle, but enough for the track to have gained about 800 feet as Hole-in-the-Wall approaches. This part of the wash may see a dozen people camping in cooler times, even though there are not so many good sites away from the road, as most of the surrounding ground is covered by loose sand and gravel; this is the reason why the remainder of the road needs 4WD, since the surface becomes softer. 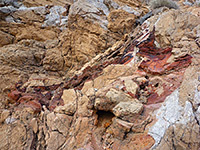 Rocks around the wash and the sandstones of the Hole-in-the-Wall ridge are yellow, whitish or light brown, while beyond, the Funeral Mountains are noticeably darker, colored shades of red, grey and dark brown. 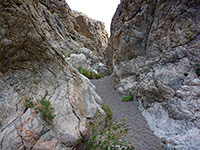 The route to Slit Canyon is through the Hole, along the track then veering left and walking due north up a dry wash, forking left at a junction after about half a mile and following the drainage to the mouth of the canyon. The narrows start soon after, at the edge of the mountains. 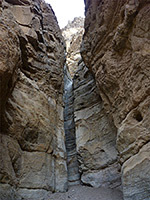 Two falls near the start are passed by climbing up on the right side; both are smooth and water-polished, one with colorful, streaked rock adjacent. The next section of the streambed has a few smaller falls before the narrowest part (the Slit), which starts with a chokestone and ends with a ten foot fall, passable to the right. The wash opens out a little but is blocked not far beyond by a chute and 50 foot drop, for which the bypass a longer, more strenuous climb up the slope on the left. The floor of the streamway to this point is mostly soft, coarse sand with some patches of bare rock. Another drainage ('Undertaker Canyon') exits the Funeral Mountains a quarter mile southeast of Slit Canyon. The entrance to this is blocked by a wall of boulders, 100 feet high, but more short narrow passages lie beyond. Climbing up is not so easy, and webbing attached to one boulder suggests that ropes may be necessary. Just the very lower end has a few photogenic places though, including patches of deep red rock surrounded by the usual grey and brown. Both canyons have good views south, across Hole-in-the-Wall to the variegated badlands lining Hwy 190.